Are you Catholic? Does the Church know? The dozen states in red below (click the map for a larger version) have about twice as many Catholics as the Church recognizes in its official counts (as recorded in The Official Catholic Directory or OCD). I am frequently confronted with skepticism from journalists and academics about the Church's estimates for the size of the Catholic population in the United States. "Don't they always pad the numbers?" They are typically surprised when I note that it is actually just the opposite. The Church systematically undercounts its population (...noted in previous posts: 1, 2). More often than not, the Church is reporting parish-affiliated Catholics, those registered and regularly attending Mass. There are a lot more self-identified Catholics out there. These Catholics represent the closest target for New Evangelization. Many are in parishes during Lent and Advent. It's keeping them engaged and involved the rest of the year that is the big challenge. 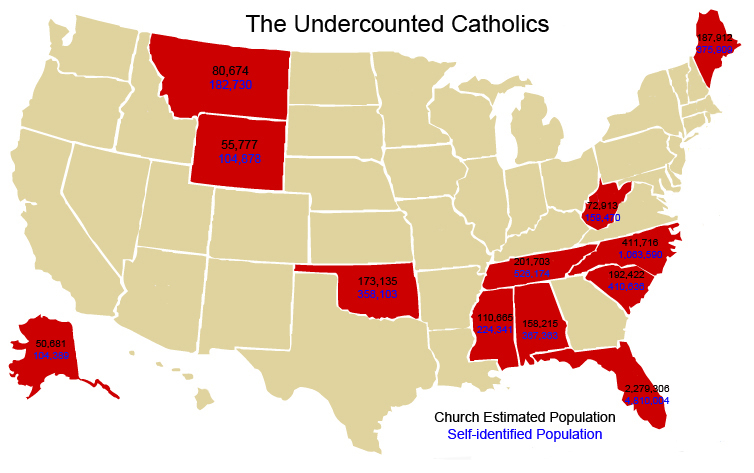 Just how many "undercounted Catholics" are there? Gallup has been doing some really cool state-level aggregations of their polls (...also used in our previous post on state religiosity and the Senate midterm elections). Using these we can see religious self-identification within states with low margins of sampling error. In combination with Census estimates for total population in 2013 we are able to estimate state-level Catholic populations (as shown in the map above). In all but five states, dioceses collectively report a Catholic population number in the OCD that is lower than what we'd assume from Gallup's data (the over-reporting states include Utah, Georgia, Massachusetts, Rhode Island, and California. In each of these cases the over-reporting is small; within a few percentage points). On average, the self-identified Catholic population of states is 51% larger than the OCD estimate. In all but one of the red states in the map above this population is more than 100% larger. Wyoming is the exception, where it is just 88% larger. There are an estimated 11.3 million "uncounted" Catholics in the United States and 42% of these (4.7 million) are in the red states above. Is the “God Gap” about to Strike Back?